"Go south of the border! 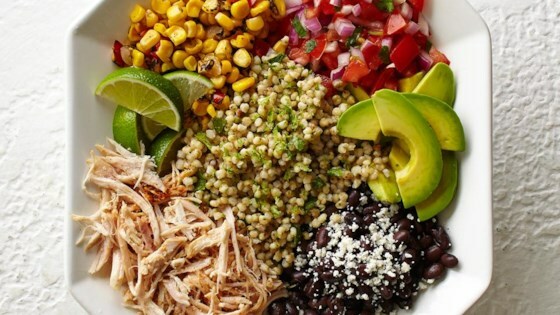 Fresh veggies, shredded chicken and sorghum create a festive meal or snack your friends and family will devour. Add sour cream and salsa to make it a party for your taste buds." In a small saucepan, boil 4 cups of water and add 1 cup of whole grain sorghum to make 3 cups of cooked sorghum. Cover with a tight-fitting lid, reduce heat to medium and simmer for 45 minutes or until tender. Fluff with a fork. In a large bowl combine chicken and Mexican seasoning. Add in the cooked sorghum, avocado, pico de gallo, corn salsa, and black beans. Season to taste with salt and pepper. Serve with lime wedges and sour cream. One skillet meal full of Mexican-inspired ingredients and flavors. For quick meal prep, you can make sorghum ahead and freeze until you're ready to use!